My wife of 8 years is currently working on her master's degree, having the courage to go back and change the course of her life by pursuing a career in something she cares deeply about. Words can hardly describe how much I admire this, as I sit at a job each day that doesn't elicit even the slightest bit of passion from me, merely a countdown of hours, minutes, seconds until I can exit the building and pretend it doesn't exist. Her goal is to enter the world of social work, a focus on mental health, a fascination with trying to understand it and also the desire to show compassion for those suffering through such internal devastation. The other day, she mentioned that an upcoming paper would be regarding the portrayal of mental health in a film, and a modern masterpiece immediately came to mind as the perfect subject matter for such an assignment. 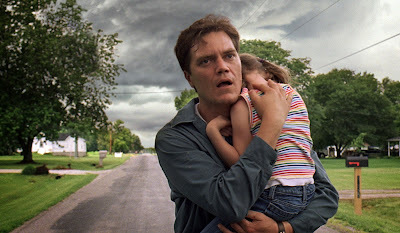 Take Shelter, the 2011 independent drama by the young auteur Jeff Nichols, is a work of extraordinary power and spellbinding performances, a tour de force master class in filmmaking that was even more stunning during this, my second viewing. The film follows a young family of three living a seemingly normal life in rural America, with one of the finest actors working today playing the role of Curtis, a hard working husband and father doing what he can to support a beautiful wife and daughter, the latter unfortunately having lost her ability to hear. Samantha, the wife and mother, is played by the amazing Jessica Chastain with strength and grace, an astonishing resiliency through tough times, a life of calm happiness shattered by the dreaded approaching storm. Curtis begins experiencing nightmares littered with apocalyptic visions and moments of shocking violence involving the people he loves most, and the effects of these dreams carry over into his conscious reality. 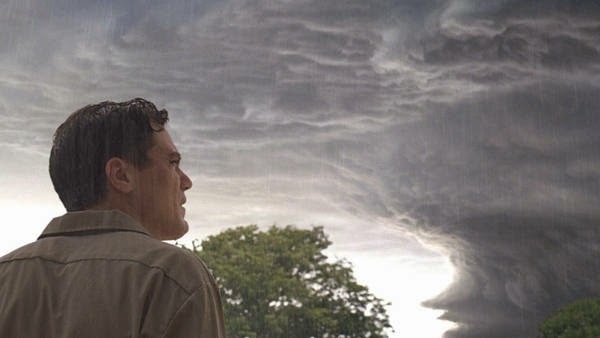 The striking thing about the unstable mind of Curtis is that he is aware enough to recognize the timing of this unfortunate progression, the realization that his mother began fighting a similar battle at the same age yet he can't stop himself from fearing the destructive storm that he believes is headed their way. Curtis risks everything, his job, his financial well being and worst of all his family as he becomes obsessed with building an elaborate storm shelter to ensure their safety. I am an optimistic film enthusiast, as I enter every single work hoping to find aspects to embrace and often times I do, but what I feel is most often missing from our current cinematic world that revolves around massive budgets and box office receipts is the importance of storytelling. It seems so simple, the concept that a film is meant to deliver a compelling story to the audience, yet far too often a film will lack any semblance of this. Jeff Nichols understands what it truly means to take an audience on a journey, to form a deep connection with setting and atmosphere and characters, and his ability to deliver a narrative with patience and maturity without ever bringing us across the line into boredom is humbling and inspiring. What he delivered here with Take Shelter is flawless, a film that has all the makings of a true classic to be cherished for decades to come. Plenty of films have been centered around mental illness, but rarely are they this emotionally draining and this expertly crafted. Nichols fabulously showcases the fact that Curtis may be suffering from the disease, but he is not the only victim of such a tragedy. The journey Samantha goes on during these perfectly paced two hours is one filled with heartbreak, with certain sequences being so emotionally draining that I wished I could crawl through the screen and just give her a damn hug, tell her everything would be alright even if I didn't believe the words myself. The loyalty she shows her husband at a time when running the opposite way would be so easy is beyond admirable. She accepts the unavoidable reality of what her family is facing and just when Curtis needs support the most, she is there to take his hand and show him that he won't be left to survive the storm alone.